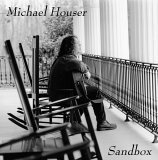 "The stars are spinning over my head/The clouds are showing their heels," sings Michael Houser on No Matter What, the lead track from his second posthumously released solo effort Sandbox. With its bright and breezy melody, the song owes more of a debt to Mike Mills’ vision of R.E.M. than it does to Houser’s primary outfit Widespread Panic, though it also serves as a fitting introduction to what inevitably was his final album. Having begun work on the outing in late 2001, Houser handed his homespun recordings to longtime friend and producer John Keane the following August, a mere week before he succumbed to pancreatic cancer. Adhering to Houser’s clearly defined vision for the project, Keane, in turn, brought Sandbox to fruition by immersing Houser’s initial forays within an array of tastefully polished production flourishes. Augmented by Keane’s own contributions as well as those of drummer Andrew Hanmer and Widespread Panic’s John Bell, Domingo Ortiz, and Todd Nance, the collection effectively provides a salve for healing the shattered hearts of Widespread Panic’s fans that resulted when Houser slipped quietly into the night. In completing Sandbox, Keane transformed Houser’s original song sketches into radiant works of beauty by coloring the dark, sinewy guitar sequences that wind through Goodbye My Love with splashes of shimmering light and bolstering the meditative musings of Solitude with the percolating pulse of spirituality. Elsewhere, he bent the bucolic, back porch twilight of Can’t Change the Past into a bittersweet slice of country-tinged pop, and he surrounded Where Does It Go’s plaintive plea for love and friendship with wisps of ominously swirling organ. Throughout the set, Houser’s lyrics waver between sad uncertainty and calm acceptance as he marches towards his fate, and although his vocal style threatens to become monotonously tedious, the raw emotion of his thoughts, combined with the effortless nature of his melodies, more than succeeds in keeping Sandbox aloft. Sandbox is available from Barnes & Noble.